The entire contents of Geocities is to be released as a torrent – granting people access to a database of websites and content that should be considered a huge part of the internet's history. 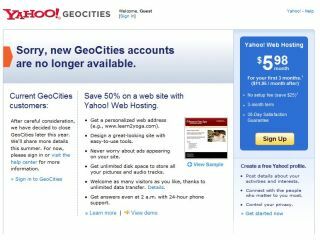 Geocities was shut down with little fanfare by Yahoo back at the tail end of 2009, but the speed with which it cleared out the data shocked many. However, the self-styled Archive Team has now gathered up that data and has announced that it will release the whole lot as a torrent. That means anyone can download it and have their very own copy of Geocities – if they have a spare 900GB of memory of course. "This is going to be one hell of a torrent – the compression is happening as we speak, and it's making a machine or two very unhappy for weeks on end," said the Archive Team post. "The hope had been to upload it today, but the reality is this is a lot of stuff– probably 900 gigabytes will be in the torrent itself. It's not perfect, it's not all – but it's something." "While it's quite clear this sort of cavalier attitude to digital history will continue, the hope is that this torrent will bring some attention to both the worth of these archives and the ease at which it can be lost – and found again."